The white shrimp season is about to get kicking on the South Carolina coast with September and October being the peak season. Trawlers eagerly rushing out on Monday mornings or dragging back in on Saturday nights, Mariners and Fishermen on deck with waders up to their hips, guys on shore kicking them off or pulling them in..... such activity! It always lures me to the coast -- I gotta get in on the action. So I came to Savannah, GA to . 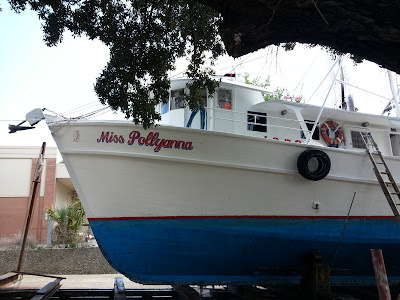 . .
catch up with Bobby Graves, a commercial fisherman from Beaufort, Captain of Miss Pollyanna, former Captain of the White Horse which I boarded here one year, in a very foolish fashion. We found the Pollyanna up on rails somewhere near Turnbolt, outside of Savannah, GA. While we were talking, this boy walked up and stared at the boat for a long time, eating his slushy. My heart melted. A little boy. A big boat. Classic. I was surprised to find Miss Pollyanna and not Graves' White Horse. In fact, I called him and told him I was lost, no sign of the White Horse. He confessed that while anticipating retirement he sold the White Horse a year or two back. But this '04 or '05 model, the last wooden boat built in North Carolina, lured him out of mankind's shortest retirement. Isn't she a beauty? Classic. Just perfect. When we arrived, the barnacles had been scraped off and Graves' son Bernie was underneath powerwashing. Tomorrow, they paint. They endured an 8-hour stormy ride down here with waves slapping against the cabin. They'll spend a couple days in the hot sun doing maintenance, then head back up to Beaufort to start taking her out again. You didn't know so much work was involved in getting you those delicious shrimp, did you? And this is just the prep work. The actual fishing raises work to a whole new level.